SEATTLE. WA -- (MARKET WIRE) -- October 13, 2005 -- No longer do ladies out and about have to face the prospect of putting their precious handbag on the floor! "dangle™" is an updated version of a vintage fashion accessory that easily slips onto almost any tabletop to create a portable hook on which fashionistas can stylishly, and safely, sling their latest designer bags. Perfectly shaped in a slinky silhouette, the mod-looking dangle is available in three colors -- brushed nickel, polished chrome and glitzy gold -- and can be purchased at www.dangle-it.com. "I was fascinated by my grandmother's vintage handbag hook, which she tells me were extremely popular in Hong Kong in the 1940's," said Belinda Leung, dangle's founder and creator. "I desperately wanted one, but couldn't find anything like it -- so I decided to create an updated version of the portable handbag hook, but with a modern day flair fit for today's fashionista." The new dangle is a present-day solution for one of fashion's most prominent predicaments -- women spend hundreds, even thousands of dollars on a handbag, yet often find no practical place to put them while dining out at the latest hot spot, sipping cocktails at a high-top bar, or simply catching up over coffee al fresco. The lightweight and compact dangle -- each unit is 4"x2" and weighs just 2.3 ounces -- holds handbags up to 85 pounds to provide an instant safe-haven hook that works with almost any table surface up to 2.5" thick. Attractively packaged in a brown leather case with pink lining, dangle comes with its own convenient carrying satchel and retails for $45. For more information or to purchase dangle, visit www.dangle-it.com. 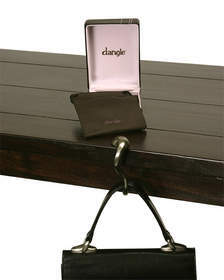 Headquartered in Seattle, Wash., dangle, LLC is committed to providing stylish handbag accessories, including its debut dangle™ portable handbag holder. After difficulty finding a handbag holder for herself -- and a stylish one at that -- owner Belinda Leung founded the company in 2004 with a desire to revive the vintage accessory and provide fashionable women everywhere a hip way to hang their handbag. Dangle plans to continue expanding its initial product offering with additional colors and seasonal designs, as well as other handbag accessories. Dangle is available for purchase at www.dangle-it.com.